Looking for the perfect introduction to Iceland's natural beauty? Head on a golden circle tour for waterfalls, geysers, & gorgeous landscapes. Looking out over Þingvellir National Park. When researching activities for Iceland, you’ll inevitably find the Golden Circle on everyone’s list no matter the season. With good reason, the popular drive is an excellent introduction to the natural wonders of Iceland so close to the capital city, Reykjavik. You’ll see waterfalls, a geothermal area, geysers, and more. Plus, one of the coolest spots, in my opinion, the meeting of the North American and Eurasian tectonic plates. Yes, you’ll be standing in between two continents! When researching the origins of the name Golden Circle, I of course discovered that the name itself is simply a marketing ploy, liken to the Wild Atlantic Way in Ireland. The name refers to the route with three main stops: Gullfoss (foss meaning waterfall), Þingvellir National Park (Thingvellir), and the geothermal area in Haukadalur with geysers. Although it’s perhaps the most touristy “attraction” in Iceland (or wait, maybe it’s the Blue Lagoon? ), do not miss the chance to be blown away by mother nature. The Golden Circle is a perfect first day trip to give you a taste of Iceland and admire its natural beauty. This tour gives you a chance to ease into the country before going on more adventurous trips where you’ll need more serious gear. Follow along as I take you through a winter day on the Golden Circle with Your Day Tours. Doesn't this picture look like a painting? You can't make this up! If you read my tips for visiting Iceland in the winter, you know that I chose not to self-drive and went with tour companies instead. Once I made this decision, I dove into the world wide web to find the BEST tour companies in Iceland. While many tour companies offer Golden Circle tours, here at TBP, we like to search for the more unique smaller tour offerings. With a ridiculously crowded market, I’m so glad to have found Your Day Tours in Iceland. It’s SO important to find a smaller tour with a top guide. Trust me, you do NOT want to be stuck on a 50-person tour bus or with a zero-personality guide for 8+ hours. Amazed by the geothermal field. After days of research, I found Your Day Tours, a young company (not even two years old at this point) owned by 3 brothers, who offer small group Golden Circle tours on mini-buses. While I don’t have an exact comparison, here are the top reasons why I know we chose well. Small-group (max 19 passenger) tour!! Comedic and knowledgeable tour guide, Aever (proncounced Iver). He shared not only great facts about the sights, but also around general life in Iceland. Seriously, he’s great! Plenty of time to take in all the sights. Ok enough chit-chat, let’s get to the tour. Not sure if this counts as a stop, but it’s worth it to point out that there’s a great bathroom and coffee break. Trust me, in winter you’re going to need the extra boost because it will still be dark at 10:30am. How do the Icelanders do it?! Make sure to check out the greenhouses as you approach. Energy is so cheap (most comes from geothermal) in Iceland, so it makes sense for them to grow products in greenhouses. They even grow a small amount of bananas! This “little” waterfall isn’t on most tours. It’s a beautiful first spot and introduction to Iceland’s grand waterfalls. This waterfall is unbelievable! The water cascades 32 meters down 2 falls with SO much power you can hear and feel it. Make sure to walk to the upper and lower viewing points. There is also a path alongside the waterfall that takes you closer, but unfortunately it’s closed during the winter. If you get lucky with a day of sun, perhaps you'll catch the rainbow over the falls. Amazed by the mist generated from the power of the waterfall on the right-hand side. Have you ever seen a geyser go off? It’s absolutely wild and one of the coolest things I’ve ever seen. Dan and I stood outside in the cold staring at the geyser for about 45 minutes watching it erupt. 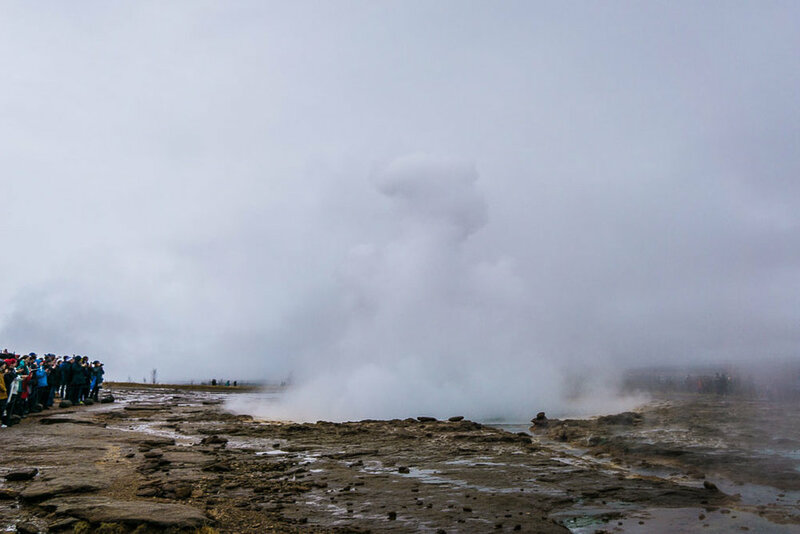 The big geyser, Geysir, hasn’t gone off in years, but its little brother, Strokkur, is very active. We walked up to Strokkur and didn’t have to wait long before it went off. It comes and goes so quickly, but don’t worry because it goes off every 6-10 minutes. Once you’ve seen your fill of eruptions, walk around the area and check out the geothermal pools. Make sure to look not touch! Yes, we saw a woman burn herself from touching the scalding water. With Your Day Tours, you’ll take your lunch break across the road from the geysers. There are a few restaurant options as well as a gift shop. There is never a bad time for ice cream...even in the dead of winter. Especially when this homemade smooth and velvety ice cream is made from the milk of cows that you can actually see at a farm in Iceland. Delicious! TBP Tip - get the soft serve in the bottom of your cone. Thank me later. The final stop of the day takes you to Thingvellir National Park, which sits in a rift valley where the North American and Eurasian continents meet. It’s so cool to walk down into the rift and think that the continents are actually moving away from each other ever so slowly. Thingvellir is also known for its historical importance as the site where Iceland established its first parliament. Looking out into the park. > Depending on the weather, I think this day is the only one you can get away without wearing waterproof snow pants in the winter. Just make sure you wear warm and waterproof boots. > The Golden Circle is the most touristy area I found in Iceland. Do not be disappointed when you see the large tour buses. It is what it is and everyone wants to see the beautiful natural wonders. Just make sure you go with a small tour company like Your Day Tours that will give you a more personalized and fun experience. > The one thing I must mention is that this tour does not stop at crater Kerið, which I learned later that day is a cool spot to see. Perhaps they can add it in if you ask? > There is a lunch break at the geysers. They have some good options: soup, salad, sandwiches, more formal lunch, etc. We brought sandwiches, but were kicked out of the seating area because apparently you can’t picnic. Just an FYI. > If you choose to drive yourself, the ice cream shop at Efstidalur II is also a restaurant and could be a great option for lunch. I heard they have the best burgers. > There’s also a waterfall in Thingvellir, Öxarárfoss, but we didn't end up going. Let us know if you do! > If you want to brave the cold waters, another great activity along the Golden Circle is snorkeling or scuba diving in between the tectonic plates. As the plates split apart, they create deep fissures in the ground. You can dive into one of them called Silfra in Thingvellir National Park. > While English is spoken everywhere, Icelandic is still the main language. Be sure to learn a word or two like Takk, meaning thank you. > You'll be picked up at your accommodation between 8-8:30am and dropped off around 5pm. If you're staying at an Airbnb, the guys will help you figure out the closest hotel pick-up. > While this is a jam-packed day, I'd still suggest booking a Northern Lights tour for that evening. Check out my post on how to see the Northern Lights for more details and how to understand if the conditions are favorable! > And make sure to check out my tips for planning a winter trip to Iceland, guide to the South Coast, and visit to the Blue Lagoon! Excited we made it to Gullfoss! Special thanks to YOur Day Tours FOR INVITING ME ON YOUR TOUR. AS ALWAYS, HONEST OPINIONS ARE MY OWN. Have you driven the golden circle? What was your favorite stop? Comment below! We love hearing from you. You can also reach out to us directly. Our tips for enjoying the geothermal seawater. An epic tour of the South Coast.